Meadow Lane was, at the time of acquisition, known locally as ‘The Great Kidney’ and had formerly been the property of the late Mr David Talboys. His family had acquired the land from The Minister and Poor Men of the Hospital of Queen Elizabeth at Donnington in 1895. When the land was advertised for sale at auction in 1958, OPTs General Purposes Committee authorised a bid for £850 to be made. One of the OPT Trustees, Mr Emden, learned that a rival bidder was interested in using the land for commercial purposes. Mr Emden successfully acquired the land at auction for £1,320 and offered it to the Trustees for £850. The Trustees reimbursed him the whole purchase price. Today, OPTs site at Meadow Lane is home to the 22nd Oxford Sea Scouts. 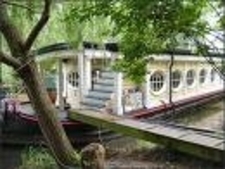 The Corpus Christi College barge is the first of three residential moorings along the back water, referred to as 'Freshman's River' on the original conveyance documents.